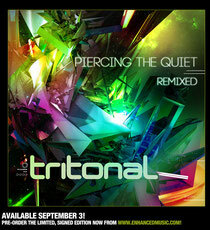 Tritonal's ‘Piercing The Quiet: Remixed’ album will finally see the light of day on September 3rd, four months since the original album was released and the remixes started creeping into the duo's sets. 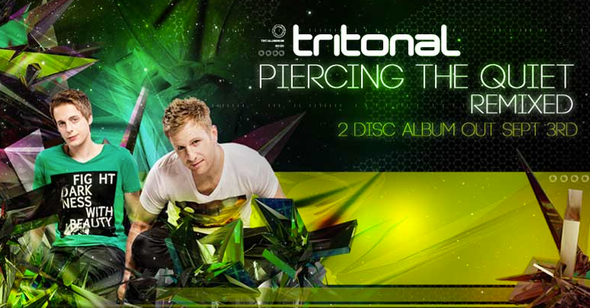 The release is double-disc album packed with 14 remixes by some of the biggest names in trance and progressive and 10 club mixes by Tritonal themselves. "It was important to us these remixes stayed true to the originals and so we worked with some of our favourite producers who brought their amazing and fresh ideas to the table," said Tritonal. Those producers trusted with remix duties include Stoneface & Terminal on 'Still With Me', Super8 & Tab, who reworked 'Piercing Quiet', trance purist Daniel Kandi on 'Broken Down' and up-and-comer Estiva on 'Ziziki'. The Rafael Frost Remix of 'Something New' featuring Jenry R. will be the first single off the album, with a release date of August 6th. Additionally, Beat Service, Craig Connelly, Seven Lions, The Madison, Ost & Meyer, Maor Levi, Juventa and Dan Stone all brought their signature sounds to the tracklist. ‘Piercing The Quiet: Remixed’ will be released on Enhanced Music on September 3rd and can be purchased as a 2-disc CD or as a download on iTunes, Beatport, and other online music portals. Fans can pre-order special limited edition signed albums now from www.enhancedmusic.com.